The Way Finder Symbols in this CAD symbols library will save you a lot time from having to drawn them from scratch. The 124 CAD block symbols are designed to be used in either metric, or imperial (U.S.) project drawings. Each AutoCAD block is drawn in a 1 by 1 unit size so as you insert them, you can easily scale them to any size you need for your project. All 124 CAD symbols come in one AutoCAD drawing file with 124 block definitions. That way you can use AutoCAD's Design Center to quickly find, preview, and insert the symbols you need. Each Way Finder Symbol comes with 2 versions, one with a solid filled background, and the other version has no background, so you can choose which version best suits your project design needs. 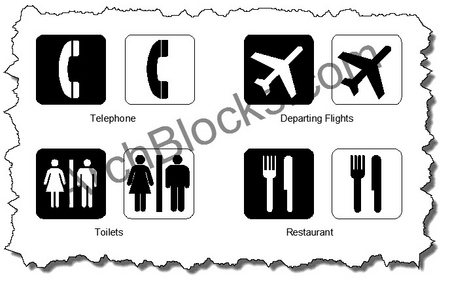 This AutoCAD block library of Way Finder Symbols is available to download NOW!